The Simpsons Ditching Apu to Avoid Further Controversy? It looks like Apu won't be appearing in The Simpsons any longer. Producer Adi Shankar launched a spec script contest for fans of the hit show to solve the "Apu Problem," and after finding a winner, he found out that the writers of the show had eliminated him. Over the last few years, The Simpsons series has come under fire for a hurtful portrayal of Indian-Americans, full of stereotypes. 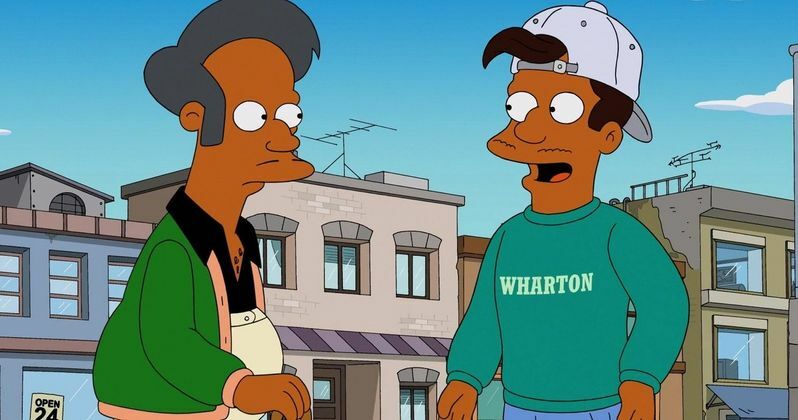 Apu, who is voiced by Hank Azaria, has run a convenience store and had a thick Indian accent since the start of the show. Adi Shankar believes that he has found the perfect script to fix the "Apu Problem" for The Simpsons, and wants the show to produce the episode. Shankar named Vishaal Buch, a family doctor in Bethesda, Maryland, as the winner of the spec script contest, and states that the script is the best way for the show to move forward. However, it doesn't look like the creative team behind The Simpsons is interested in making it. Shankar explains. "I got some disheartening news back, that I've verified from multiple sources now: They're going to drop the Apu character altogether. They aren't going to make a big deal out of it, or anything like that, but they'll drop him altogether just to avoid the controversy." Filmmaker Hari Kondabolu's 2017 documentary The Problem with Apu started the controversy, which The Simpsons addressed with an episode entitled, No Good Read Goes Unpunished and further added to the backlash. Since then, Apu has barely had any lines on the show. In a cryptic response to eliminating Apu, Fox said, "Apu appeared in the 10/14/18 episode My Way or the Highway to Heaven." Apu appears in the background of a scene and does not have a speaking part. Adi Shankar thinks that the show is making a mistake by getting rid of the beloved character. He had this to say. "If you are a show about cultural commentary and you are too afraid to comment on the culture, especially when it's a component of the culture you had a hand in creating, then you are a show about cowardice. It's not a step forward, or step backwards, it's just a massive step sideways. After having read all these wonderful scripts, I feel like sidestepping this issue doesn't solve it when the whole purpose of art, I would argue, is to bring us together." Hank Azaria has talked about the controversy and said that he was willing to step aside and let another actor take on the role. Azaria also said that he would like to see The Simpsons bring an Indian-American into the writing room to get real insight, which is exactly what Adi Shankar's contest was promoting. In the end, Azaria said that he was okay with whatever decision that the writers decide to make. Neither Fox nor The Simpsons have confirmed that Apu has been dropped from the series, but he really hasn't had a lot to do on the last three seasons. It would be a shame to see the producers of the show completely remove the character instead of trying something new, which could reset the story of Apu. There's still time to change things up, so let's hope that this news doesn't stick. You can read the rest of the interview with Adi Shankar over at Indie Wire.